These smell delicious even before they go into the oven. Serve with top-quality pasta like our favourite, Martelli from Panzano in Tuscany, or potatoes roasted with rosemary. Wine Suggestion: naturally this goes with Chianti, but feel free to adventure a bit further if you like as a good Brunello with a bit of age will make this feel a bit special despite the humble ingredients. Don’t use your best wine in the sauce though; we used a nice, but inexpensive Bordeaux which had good fruit and tannin. 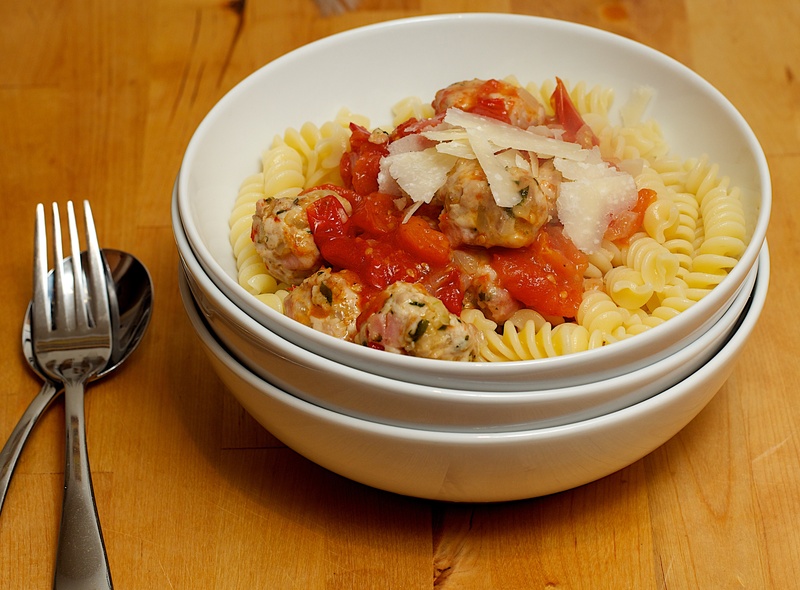 Mix all the meatball ingredients together in a large bowl – the easiest way is to use clean hands. When everything is mixed together really well, wet your hands and roll into small or large meatballs (aim for 12 large meatballs or 20 small ones). Gently toss the meatballs in 2tbsp of olive oil in an ovenproof shallow casserole or roasting tray. Try to find one that is just big enough to fit the meatballs but not so they are squashed together. Bake the meatballs for 10 minutes, then pour over the wine and turn the meatballs over to make sure they are coated. Return to the oven for another 10 minutes. Stir in the tomatoes, sugar and basil, then cook for another 20-25 minutes or until bubbling and thickened. Serve with pasta or roast potatoes with rosemary. Delicious meatballs with a real summery feel. Use fresh broad beans if you can get them but frozen will work just as well. You can prepare this dish in advance and just reheat before serving. Wine Suggestion: The trick with this dish is to make sure the wine is medium bodied so a lighter red with ripe (not dry) tannins would work a treat. An easy and uncomplicated shiraz cabernet blend from Australia or a nice Pinot Noir would work a treat. Alternately a medium bodied white like a good Verdicchio is a great option too. We drank the Umani Ronchi Casal di Serra Verdicchio which matched the dish perfectly with good depth of fruit and a great minerality which allowed the food and wine to shine equally. Put all the meatball ingredients into a large bowl. Add ¾ tsp of salt and lots of black pepper and mix well with your hands. Form into ping-pong sized balls (you should get about 20). Heat 1 tbsp of the olive oil in a very large frying pan with a lid. Sear half the meatballs over a medium heat, turning until browned all over, about 5 minutes. Remove, add another ½ tbsp olive oil to the pan and cook the other batch of meatballs. Remove from the pan and wipe clean. 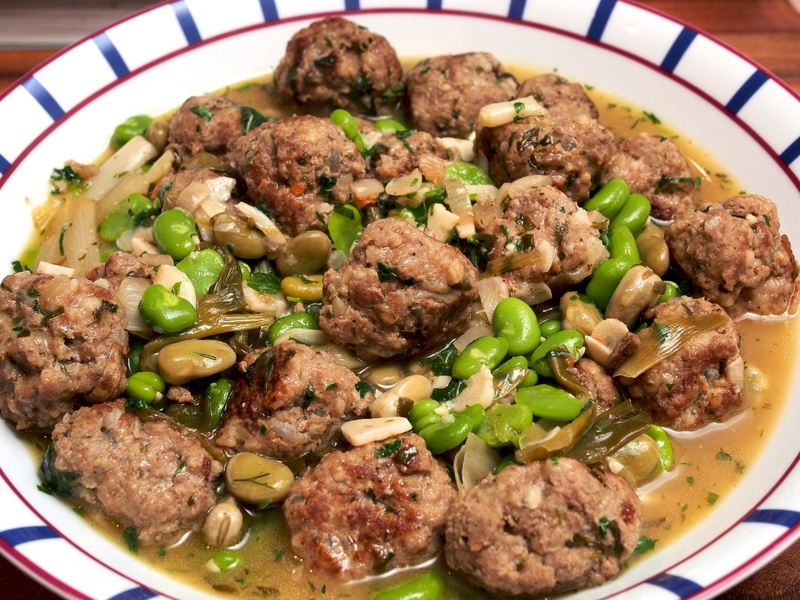 While the meatballs are cooking, put the broad beans into a pot of salted boiling water and blanch for 2 minutes. Drain and refresh under cold water. Remove the skins from half the broad beans. Heat the rest of the olive oil in the pan you seared the meatballs in. Add the thyme, garlic and spring onion and sauté over a medium heat for about 3 minutes. Add the unshelled broad beans, 1½ tbsp of the lemon juice, 80ml of the stock, ¼ tsp of salt and lots of black pepper. The beans should be almost covered with liquid. Cover the pan and cook over a low heat for 10 minutes. Return the meatballs to the pan. Add the rest of the stock, cover the pan and simmer gently for 25 minutes. Taste and adjust the seasoning. If the sauce is very runny you can remove the lid and reduce a bit. The meatballs will soak up a lot of the juice so make sure you have plenty of sauce left. You can leave the meatballs off the heat now until ready to serve. Just before serving, reheat the meatballs and add a little water, if needed, to get enough sauce. Add the rest of the herbs and tablespoon of lemon juice, the shelled broad beans and stir very gently. *Baharat Spice Mix – 1 tsp black peppercorns, 1 tsp coriander seeds, 1 small cinnamon stick – roughly chopped, ½ tsp whole cloves, ½ tsp ground allspice, 2 tsp cumin seeds, 1tsp cardamom pods, ½ a whole nutmeg grated. Blend all the spices in a grinder or pestle and mortar until you have a fine powder. Store in an airtight jar.